I was raised in Imboden, Arkansas. I started playing the guitar and harmonica at the same time when I was 15 years old. 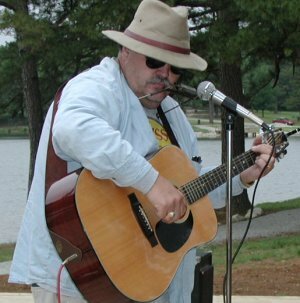 About six years ago I began playing with a street group called the Chubby Chiggers from Hardy, Arkansas Friday and Saturday nights and in the winter we would move into any restraunt that would have us. Old country was the standard fare, but I was raised on Dylan so I would slip some Dylan songs in once in awhile. About four years ago Judy Kerley, an instructor at Ozarka Technical College at Melbourne, introduced me to a collection of Robert Johnson and from then on Blues was a passion. Currently I am Superintendent of Schools at Fair Play, Missouri but I still manage to play the VFW occasionally and also play for a group called Gospel Express from Springfield, Missouri. Writing is another passion and I have several songs which I'll be glad to add to your repertoire.